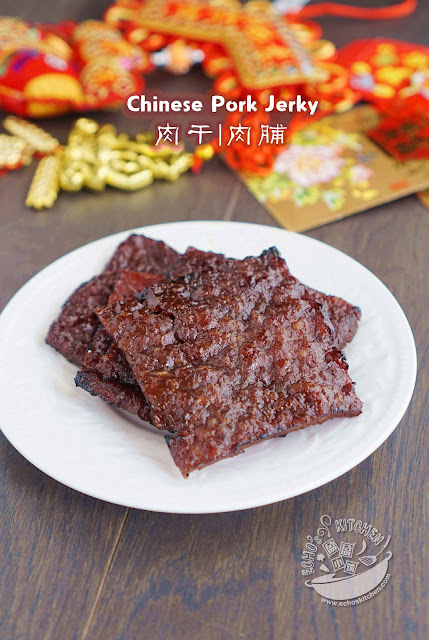 This may sound like a crazy thing now, but the wait makes the BBQ meat all the more precious, so is the memory of celebrating Chinese New Year with families. 1. Mixed all the ingredients listed with minced meat using a spatula and stir at one direction till it become a sticky mixture. Let it sit in the fridge for at least 1 hour to marinate. 2. Tear off a piece of foil paper (around 1 ft long) and a clean plastic bag (cut it open to make a big plastic cover). You can also use a small silicon baking sheet or Cling paper. But I find these plastic bags easier to work with as it doesn't "cling" too much to the meat. 3. Spray or spread a thin layer of oil over the foil paper. 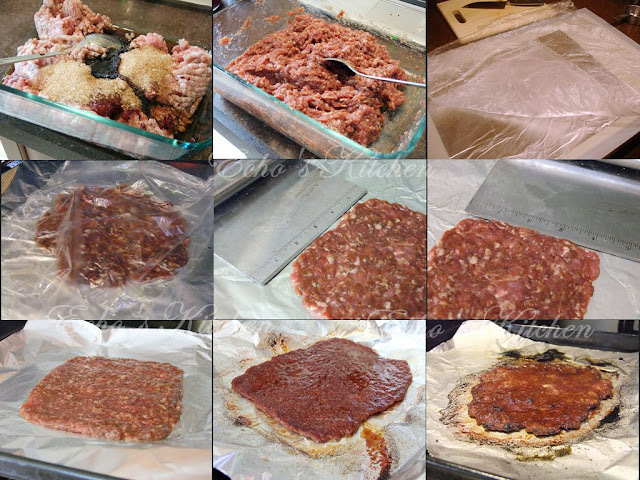 Place about 1/2 cup of minced meat in the middle of the foil paper, cover it with plastic cover and use your palm to lightly press on the minced meat until it flatten, using a rolling pin to roll it evenly into 3 mm in thickness . Move the foil paper together with the minced meat onto a baking sheet. 4. Broil the meat in the oven for 8 minutes, there is no need to preheat oven. 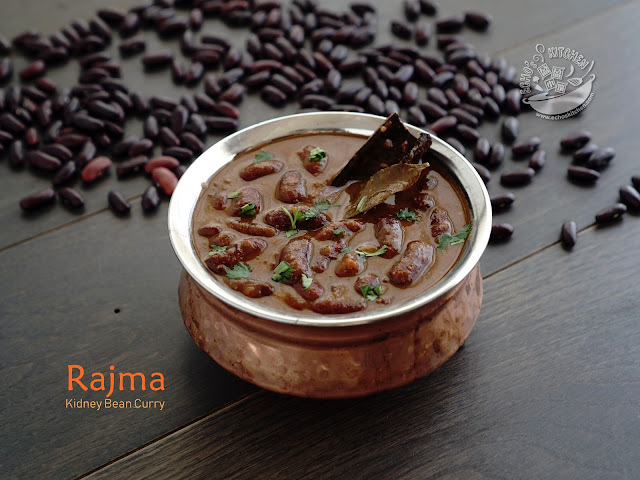 You will find some juice releases from the meat after 8 minutes, take the meat out and flipped the meat using a tong, let it sit for 2-3 minutes, you can now work on rolling out the second piece of minced meat. 5. The juices of the half-baked bak kwa is now being absorbed back into the meat, now is the time to place it back into the oven and broil for another 6-8 minutes or until the edges are a little charred. 6. Repeat the steps until all meat are done. Let cold, and cut into pieces. 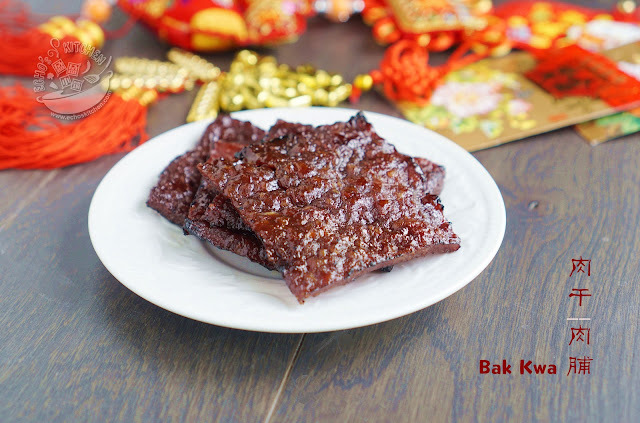 Note: I find the thickness and the size of this Bakkwa affects the taste and texture of it, 3 mm in thickness while it is raw at the size of 5 x 5 is by far delivery the best results for me. I strongly suggest that you stick with it. Znette... thanks!! And I am glad you enjoy my blog... welcome and do come visit again sometimes!